Tom T. Hall lyrics and chords are intended for your personal use only. He has written and recorded many excellent country songs. Maybe these country lyrics will remind you of your favorites. The legendary Tom T. Hall is known as "The Storyteller" because of his great skills at storytelling in his songwriting. He started his own band as a teenager and through the years has given us hundreds of great songs to enjoy. Many well known artists have enjoyed recording his music and that in itself shows what a wonderful songwriter Mr. Tom T. Hall truly is. 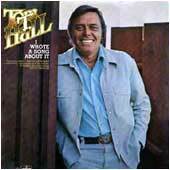 Low prices on Tom T. Hall Cds and easy to download MP3s .